Not having a plan has got off to a great start! We thought we would have left The Midlands, in KwaZulu Natal, a while ago but, 3 weeks after I got back, we are just starting to (re) pack the caravan up! The days have been filled with caravan jobs; taking everything out (who knew how much could be fitted in such a small space! ), repacking, finding room for my things too, cleaning and scrubbing inside and out. Right now, everything is in, even the washing machine (having clean clothes and sheets is SO nice, right?) And, there’s still space to swing a (small) cat. All this (and more) fits in the caravan! Getting used to living in a small space not designed for tall people is going to take some doing. No matter how many times either of us hit our head, our brains don’t seem to remember where the sharp corners are. Morning greetings have gone from ‘it’s your turn to make coffee’ to ‘don’t hit your head when you sit up.’ If they aren’t uttered in time, the other person holds a grudge for the lack of reminder 😉 The dogs are oblivious to our suffering and swearing. Instead, they are focused on staying as close to us as possible so they don’t get left behind and miss out on the adventure they know is coming up! In between all things caravan we have been exploring the Midlands, an area I have only spent a little time in beforehand. It’s where the boy did some of his growing up so he’s enjoying being tour guide. The Midlands is a ‘funny’ area…funny because for me it seems so English; green countryside, rolling hills, mountains and waterfalls and real, proper towns. The small reminders that I am indeed in Africa come from being hustled at the robots (traffic lights) and driving away with a new sun hat but R100 poorer without really understanding how it all happened. And the (lack of) internet connection. Oh, and the weather; for winter 18 isn’t too bad. We’ve been staying in Howick, home to Howick Falls and the central point of the Midlands Meander; a meander of roads connecting small towns and lined with arts and crafts stores, artist studios, cheeseries, chocolatiers and breweries. An ideal place to while away any amount of time. In between stopping in at some of these, we’ve explored the waterfalls in the area; Karkloof Falls and Howick Falls where the boy has, on more than one occasion, ‘thrown’ himself from the top to abseil down. The first time I watched from the top while he read the last few safety pointers from his self teach manual before stepping off. The second time I waited at the bottom. Keeping my feet firmly on the ground at the top of the falls! Our fishing attempts at Midmar Dam weren’t very successful but luckily we went prepared with meat as a back up. I had my first traditional skottle (gas BBQ with a pan rather than grill). By our second visit I was a professional skottle master, cooking with a drink in hand! One of my favourite things in the area is the Karkloof Farmers market; a barn that fills with locally grown and made produce every Saturday morning. From Kir Royals made with home-made raspberry liquor to (The. Best.) Millionaire’s Shortbread, it’s the prefect way to spend a few hours. In preparation for hitting the road, we spent a day in Durban running errands (mostly picking up Landy parts because there are no Landy dealers out west). We brightened the day up by stopping off en route to see the impressive Valley of A Thousand Hills and the halfway point for the Comrades Marathon. Anyone who runs the marathon once is impressive, let alone 5 or 10 times! It’s an ultra marathon of 89 kms / 56 miles. Craziness. On the way home we drove through Inanda Dam, climbed up the Foefie slide; a long zip wire across the dam which luckily wasn’t working so I couldn’t be talked into actually sliding down! 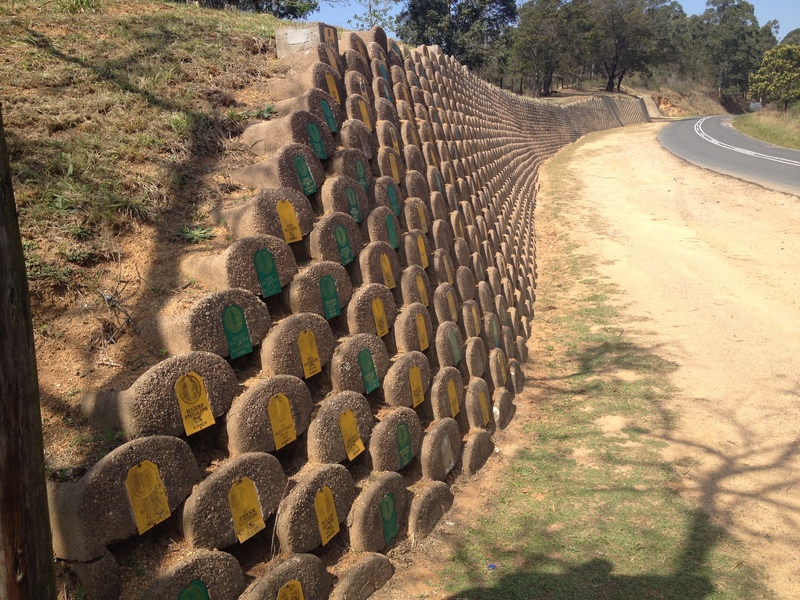 Plaques representing everyone who has run in the Comrades marathon either 5 or 10 times! So, it’s been a blast exploring the area and getting used to living in the caravan but it’s time to see how much fun it is hitting the road! Enter your email here if you'd like to get more content like this, straight to your inbox! If you’re bored with life or curious what you could do differently, you’ve come to the right place. Princess in a Caravan is a blog dedicated to helping people like you learn more about the possibilities of getting off the typical tourist path, volunteering, teaching and travelling. You can see the world, explore it how you like (maybe in a caravan? ), and do new, amazing things. Although I really do like pink sparkly things, I am not a real princess (I have been known to don a tiara) but I do live in a caravan. When you start realizing that life can be lived differently, things change. Humans are naturally nomadic. Cue Caravan. A year after arriving in South Africa we (my boy and I) packed our belongings and dogs into a 30-year-old caravan to hit the road. Join me for the journey and see where it takes me. Do you want tips and advice on how to teach overseas and travel the world? Do you want to hear from people who are doing it already?